Arnold Daghani was born in Suczawa, Rumania on the 22nd February 1909 and died in Hove, Sussex on the 6th April 1985. Before the Second World War he spent time travelling, working as a publishing house apprentice, and then as an import/export clerk. He married in 1940 and in 1942 he and his wife were deported by the Nazis to a labour/extermination camp in the Ukraine. On the 15th July 1943, Daghani and his wife escaped to a ghetto in nearby Bershad; the remaining inmates of the Nazi camp were later killed. After the war, Daghani moved and by 1958 left Rumania for good, spending 2 years in Israel before travelling to Italy, Switzerland and the south of France, before finally settling in England in 1977. Other than a few classes in the 1920s, Daghani had no formal art training. 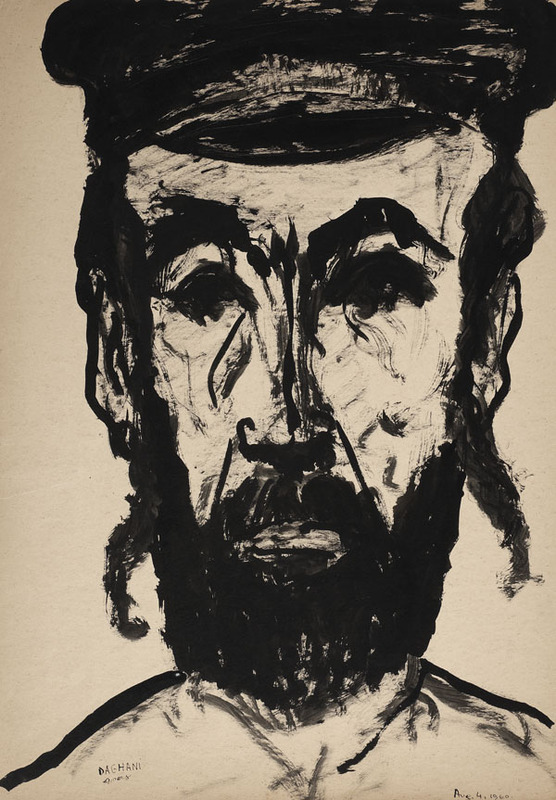 He lived a fragmented life of upheaval and change, which he documented well through his art and writings, and suffered from chronic depression and occasional suicidal tendencies. He created detailed journals and sketchbooks where writing held equal importance to illustrations. He produced art constantly, from mundane images of general life, including still-life drawings and collages, to detailed depictions of present and past events. In 1992 the exhibition 'Drawings by Arnold Daghani' was opened by Monica Bohm-Duchen at Ben Uri Gallery in Dean Street, Soho, to coincide with the publication of 'The Seven Days of Schlemihl', written and illustrated by Daghani. Number 7 in a portfolio of 47 loose works.